BERLIN (Reuters) - Germany's centre-left Social Democrats (SPD) unveiled a position paper on Sunday that calls for more generous state allowances for the unemployed, children and pensioners, seeking to appeal to working class voters in four regional elections this year. The SPD, junior coalition partners of Chancellor Angela Merkel's conservatives, have been debating how to regain the confidence of voters who handed them their worst results since 1949 in a 2017 national election. Even though Merkel's conservatives are likely to oppose most of the proposals approved by SPD leaders at a meeting in Berlin, there is little risk the blueprint will ignite a crisis in the government. 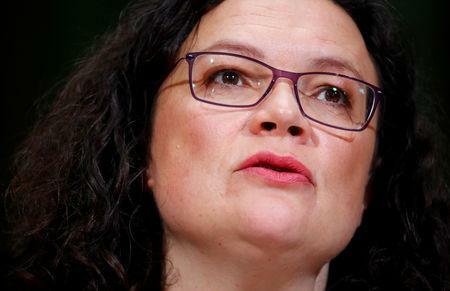 "This is not our aim," Nahles said when asked how many concessions she expects to get from Merkel's Christian Democrats (CDU) and their Bavaria-based Christian Social Union (CSU) sister party. "This is about a position paper of the SPD ... and this means we will campaign based on this concept with the goal of convincing people," she added. "But I am curious to know how the conservatives react to it." Both the SPD and conservatives were punished in the 2017 election by voters angry at Merkel's decision two years earlier to welcome almost a million asylum seekers, mainly Muslims from Syria, Afghanistan and Iraq. Merkel's CDU was holding a separate meeting on Sunday and Monday in Berlin, and politicians and experts were expected to debate how integration and immigration policies can be improved. The SPD's new policies are the boldest attempt yet to undo some of the "Agenda 2010" reforms enacted by their own party under then Chancellor Gerhard Schroeder over a decade ago. "Today is a day of the liberation in the recent history of the SPD," SPD youth wing chief Kevin Kuehnert told the Rheinische Post newspaper. "This new concept puts an end to a long period of uncertainty and volatility." In national opinion polls, the SPD, which won just over 20 percent of the vote in 2017, has 17 percent support, behind Merkel's conservatives who are on 30 percent.